Web development is a very interesting yet exciting career to choose. It has been observed that from past decade the need of web developers has raised from 40% than ever before. Yes, it is true. Due to the advancement of internet technology many small businesses have joined this world wide web facility to give a boost to their business. One of the most integral aspects of web development is web programming that is achieved with the help of programming languages. Now there are lots and lots of programming languages to try. So I have provided you with the list of top 5 Best Programming languages for web development. But before that, we must be clear about the term web development. It is the process used for creating the websites which can range from creating a simple single webpage to hundreds of complex websites. A website is basically a collection of web pages and a webpage contains all the information that needs to be displayed on the internet to the user. In order to display that information web developers use various programming or markup languages which are used by browsers to display the content. 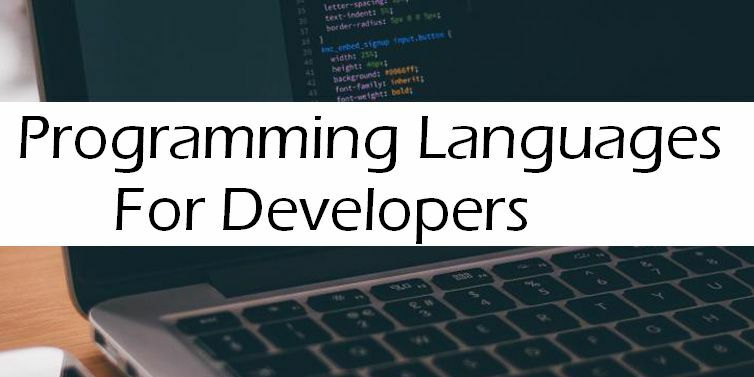 In order to pursue web development as a profession, one of the most important things that you will need to consider is having expertise in programming languages. Back-end Development stands for that type of development which is not visible to the user. In simple words, it handles all the data which has to be processed by the server provided by the user in order to return some result. For instance, if you search any query on google search bar then that search bar is made by a front-end developer but the working is done by back-end developer. Like if you search Barak Obama on google then the way to provide you with the relevant result is pre-coded by the back-end developer of google. Programming languages for web development. The term CSS stands for Cascading Style Sheets is rather a markup language similar to HTML. With the help of HTML and CSS, we can design the stunning websites.CSS allow a developer to decide and define how a web page or a website will eventually look or how it will appear to the visitors of the web platform. For instance, the use of elements like font-size,font-family,text-align makes a webpage look very beautiful to the eyes. But we should always remember that CSS alone can’t make a webpage functional we have to use other languages too. The term PHP stands for Hypertext Preprocessor which is a server-side programming language. It is also known by the server-side scripting language. It is most suitable for server-side programming that has server tasks being repeatedly performed when the website development process is on. PHP is open source and fast prototyping language. It is compatible with UNIX based Operating System as well as Windows Operating System. PHP is mostly used in startup businesses, advertising apps, and small software organizations. It is one of the most preferred back-end programming languages to learn as well. Ruby is a dynamic programming language developed in the year 1993. It is widely used for the creation or programming of mobile apps and websites. This open source platform is not only simple to understand but also easy to write as well. But if you are a developer who wants to learn Ruby, then you will also have to equip yourself with the knowledge of Ruby on Rails. Twitter and Basecamp use Ruby. Python is a highly used and all-purpose programming language which is dynamic in nature. Its dynamic nature makes it very popular among full stack developers as well. Being dynamic in nature means that as a developer we can write and run the code without the need of a compiler. Some of the apps that are powered by Python are Rdio, Instagram, and Pinterest. Besides this, some other web platforms that are supported by Python are Google, NASA, YAHOO etc. The goal of the developers of this language was to make it fun to use one. The developers worked on the language in such a way that it could reduce upon premature optimization. So these were some of the best programming languages for web development. If you have any better suggestion then let us know in the comment section below.